Wonder is this year's theme for students and faculty at Atrium, and the lessons happening at school right now illustrate how wonder is all around us. Students across the grades are stopping to notice the wondrous elements of science, from the way sun makes a shadow to the way sound passes through a taut string. PreK students are making rayographs to study the sun and how shadows are made. PreK continues to explore the Sun, by focusing on shadows. We read the book What Makes a Shadow? by Clyde Robert Bulla and started to observe shadows in our classroom and outside. The Originators set up blocks by the window and built structures that created shadows on the floor. We also used sun paper to create shadow collages before reviewing our Wonderings about the Sun. Then using books, the internet and a short video, we answered our own questions. We are discovering that you can wonder about anything and even scientists are still learning about the things the study. We read the book What Makes Day and Night? We discussed the relationship between the Earth’s rotation and the position of the Sun. 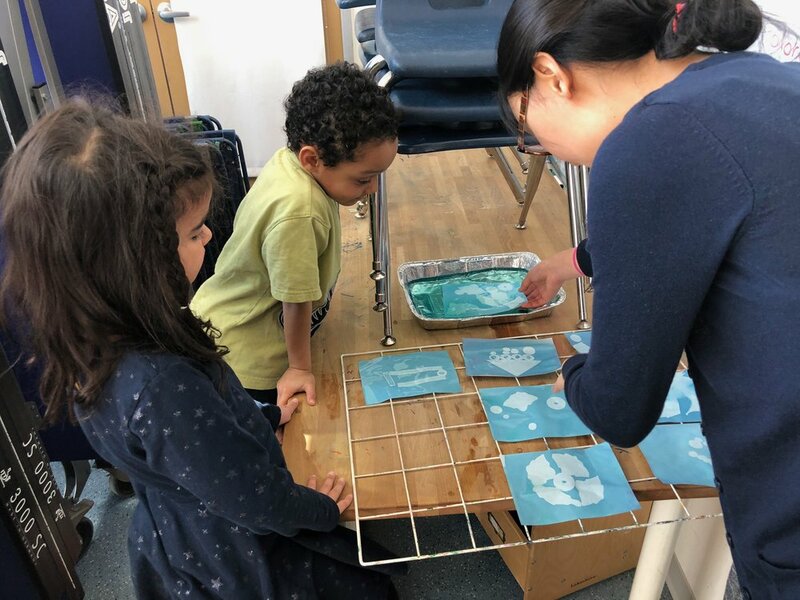 As part of a lesson about engineering, Kindergarteners made and tested their own dams. The Hikers watched a video about the Hoover Dam and how the engineers designed it so it could be strong and generate electricity for L.A. California. Then they watched a Zoom video with two children making a dam with sand, gravel, popsicle sticks, and clay. Following the video, the children had similar containers to try making dams for themselves in collaborative teams and then test their work. First graders measured the space of their tide pools, as well as deciding what animals would live there and what the space would ultimately look like. During theme this week the Climbers began building a tide pool in the classroom. As a continuation of their measurement unit, they calculated the dimensions of the space to be used, before sketching their visions of the tide pool. Next, Climbers chose which animals would live in the space and sketched what they look like. They also planned out what animals they would create out of clay and began to make them. First graders created their own clay animals as part of their tide pool unit. We learned that sound waves can travel through water and through solid material. We used a "listening tube" to hear sounds underwater and we listened to sound waves traveling through a table. We made our own string telephones and learned that sound waves will only travel along a taut string. We had fun noticing the vibrations of the string and cups. 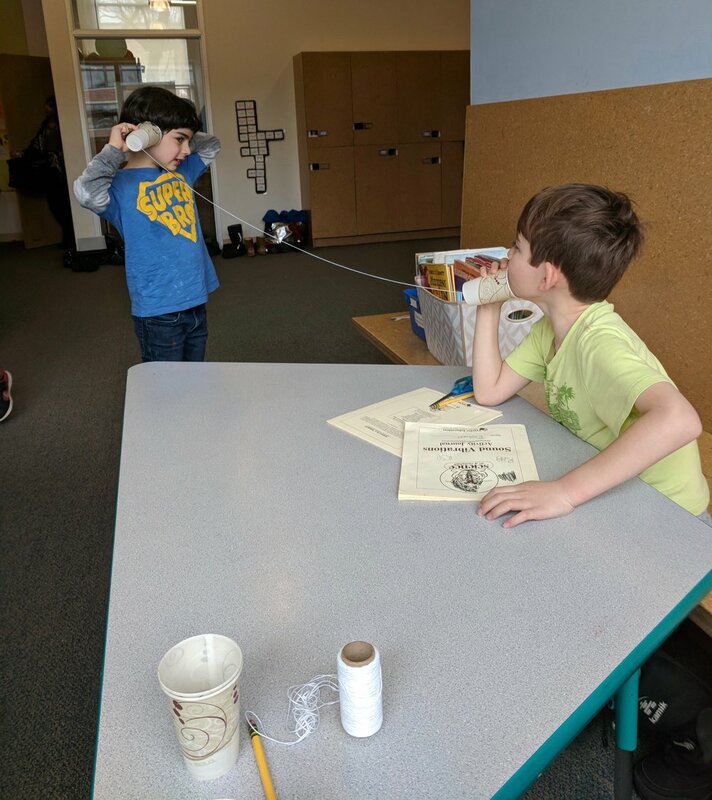 Second and third graders are learning about sound waves by testing how sound works through string telephones. Fourth and fifth graders are beginning to launch the World Geography Climate Project. This is an extensive project that permeates many of our curricular areas, including the the construction of model homes, experiments with water and air, and research on global climate conditions. During this unit, students will become researchers, architects, and geographers. We will begin a unit on non-fiction where students learn about text and graphic features in order to better navigate a dense text. From this they will begin to research their location around the globe in order to figure out how climate affects the lifestyle of their area. Using the research on climate, students will begin to develop a plan for what houses look like in their area. Based on certain climate conditions, the architects change the look and functionality of their homes. From this sketch, they will construct a model made from mostly recycled materials. Sixth grade scientists explored the structure and composition of Earth’s layers this week, while working on key science process skills at the same time. They analyzed graphs of temperature and pressure with increasing depth to understand how the interplay of these variables affects layer properties. They evaluated evidence statements to build a reasoned argument for the composition of the core, and played with oobleck to model the plasticity of the asthenosphere. For DEAR day, they read graphic novels based on the research of geologists and oceanographers on the International Drilling Project vessel the Joides Resolution, a ship that outfitted to drill through the oceanic crust towards the mantle boundary layer. Next week we’ll wrap up our study of Earth’s interior with the perennial favorite “Earth as a Truffle” project. In seventh grade science students explored natural selection through a case study of Galapagos finches. They mimicked differential survival in a beak simulation game, learned about Darwin’s legendary trip on the HMS Beagle, sorted finches into phylogenetic groupings and engaged in a highly analytical virtual discussion on their categorizations, watched a documentary with Rosemary and Peter Grant’s lifetime of data collection on Daphne Major, measured medium ground finch beaks to mathematically determine if variability existed in a population, graphed population and food availability before and after environmental change, and analyzed the Grant’s research findings of finch evolution following drought conditions. For DEAR day, they had a choice of reading material, including reproductions of Darwin’s original correspondence, interviews with the Grants, and articles by Jonathan Losos, whose Caribbean anole research will be next week’s case study! Eighth grade scientists began the week exploring examples and energy diagrams of endothermic and exothermic chemical reactions. Then they began a week-long engineering challenge: to design a transport container that is chemically thermo-regulated that is optimized to carry a biological specimen in the field for conservation biologists. Teams were randomly assigned to design a solution for either endangered diamondback terrapin eggs or honey bees. This week’s challenge work focused on pre-testing a selection of possible chemical reactions to determine which best met the criteria for their assigned client. Next week they’ll build, test, and modify our devices. For DEAR day, students participated in a read-aloud of chapters from several books of science essays.